Compelling storytelling moves people on an emotional level; it makes them care. If you’ve ever watched a reality talent show like American Idol, you know that the story behind the singer is what makes an audience connect with and root for them. Nonprofits may not get to tell their stories to a prime time TV audience, but sharing individual stories is still a powerful way to engage supporters. The good news is that every cause has a story to tell and there are many ways to share them with your community. These five examples of great nonprofit storytelling show how organizations can turn any campaign into an engaging narrative through email, social media, videos, and more. Art Start’s Family Portrait Project puts people who have been impacted by their work front and center. Through creative arts programs, this nonprofit helps vulnerable and at-risk New York City children gain the confidence and skills to pursue a meaningful life. And through beautifully shot videos, we meet resilient people like the Hargroves who tell their stories in their own words. Teens tell us about their difficult pasts, their current creative projects, and the future they are working toward. That’s what makes Art Start’s videos so impactful—they allow all these young people to take control of their own stories. The hope and ambition they express shows audiences how Art Start empowers their clients to dream big and work hard. The Dyslexia Institute of Indiana provides testing, tutoring, a summer day camp, and more to families living with dyslexia. 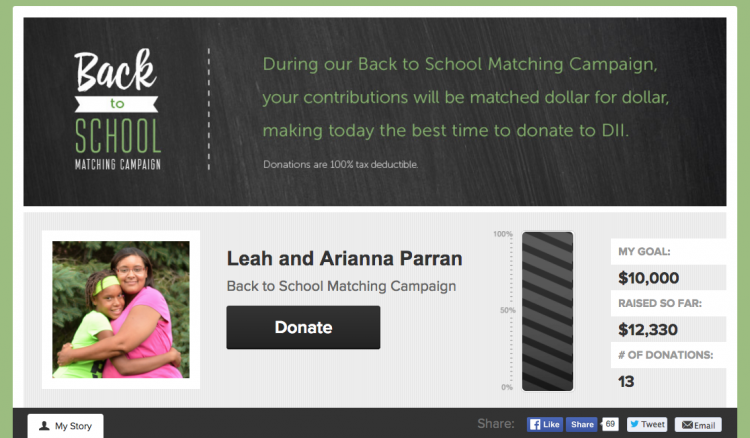 For their 2015 Back to School Matching Campaign, they introduced donors to four individuals and families who have benefitted from DII’s programs. DII’s videos also show that you don’t have to be flashy to get people’s attention. The videos are well-done, but they let the families do the talking. With the four fundraising pages, the Dyslexia Institute of Indiana was able to exceed their goal of $40,000. Along with positive parenting classes, CAPS runs a preschool, trains court-appointed advocates for children, and helps families navigate the courts and public assistance systems. For their 2015 #GivingTuesday campaign, the organization brought their programs to life by introducing their community to the parents and children they work with. 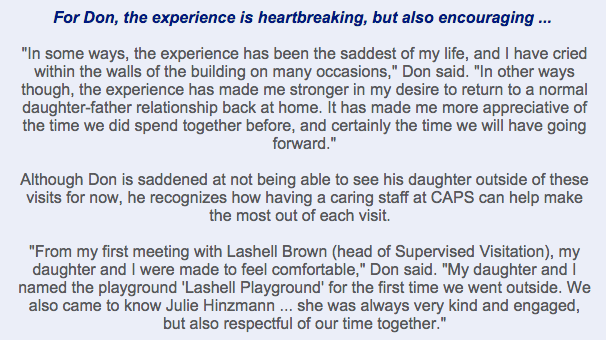 Beginning in early November, CAPS sent their supporters a series of emails showing the diverse circumstances and needs of their clients. Subscribers met Don, who is using CAPS programs to maintain a sense of safety and normalcy for his child during a high-conflict divorce and Jessica, a single mom who needed help applying for housing for herself and her disabled son. CAPS’ #GivingTuesday campaign combined powerful stories with a simple email series to show supporters the real impact of their programs. They remind readers that at the center of every custody battle, family court case, or crisis, there are children and a family fighting for security. With 24 million people living under an oppressive regime and 25 percent of their children malnourished, there is far more to the story of North Korea than the eccentricities of their rulers. Liberty in North Korea works to support grassroots change and rescue people fleeing the country for better life. Their free passage model of escape has rescued and resettled 405 North Korean refugees. Along with supporting the North Korean population, one of LiNK’s goals is to change the narrative around the country and its people. Through media campaigns and tours, the organization seeks to make the dialogue on North Korea one about “people not politics.” Through their documentaries and presentations in schools, places of worship, and community centers, LiNK has already been able to reach 270,000 people. At the center of their media campaigns are the stories of real refugees who have escaped. Knowing that statistics can only do so much, LiNK shows supporters the people their donations support. For protection from retribution, many refugees obscure their faces. With videos and individual stories, LiNK is bringing a huge, complex issue into focus for the regular people that support them. More Than Me are expert social media storytellers. 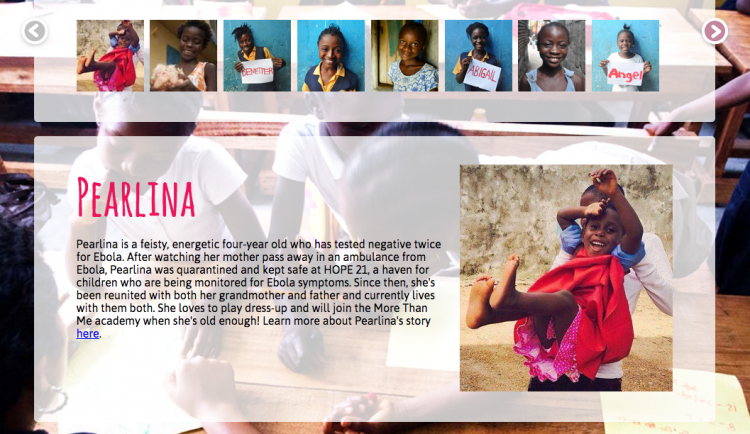 Because their mission is to educate and empower the most vulnerable girls in Monrovia, Liberia, they put the girls’ stories front and center on their website and on social media. The organization’s Instagram profile introduces some of their students and lets them tell their stories. They explain how More Than Me’s tuition-free academy and holistic services have changed their lives. On the organization’s website, supporters can also meet some of the students and learn about their background, goals, and favorite things. Although More Than Me operates in Liberia, they can create an emotional bond with donors around the globe through the individual stories they share. No matter where you operate, a well-told story can bridge the gap between supporters and your on-the-ground impact. And More Than Me also shows that sometimes a quality picture and a short caption or quote is all you need to show donors how their gifts change lives. When it comes to reaching people and inciting action, a well-told story can communicate more than spreadsheets and metrics. Humans have been telling stories since as long as we’ve had language. It’s how we learn, entertain ourselves, and experience circumstances different from our own. If you want to touch donors, there is no better way than to introduce the real people and stories your work impacts. Whether it’s a simple email, a video, or images on social media, find the stories surrounding your organization and share them. The emotional connection they create can drive supporters to act.